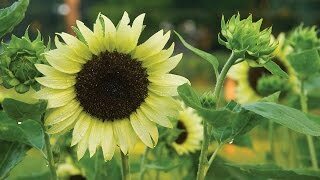 Infinite beauty from plants that grow so quickly, your garden or patio will be filled with sensational sunny color 3-4" blooms before you know it! Spectacular as a cut flower, too. For best branching, pinch off the main stem above the fourth or fifth pair of leaves as it’s growing. Plants won’t set seed and are disease-resistant. Sunflower, Sunfinity Hybrid is rated 3.0 out of 5 by 4. Rated 5 out of 5 by Farmgirl15 from Beautiful Had 100% germination rate and looks great in field production. Full of blooms every three days to cut for vase. Rated 1 out of 5 by KathleenAmbrose from Looks great in the pic... did not grow. I received five seeds for $9.99. Not one sprouted. I am a Master Gardener with many years of growing experience and I have to think there was something wrong here. I was hoping for so much more and even saved the spot where these were intended to grow. Had to go to Plan B.